Today Whatsapp is the leading messenger application as we all know. Most of us living in an assumption that only one whatsapp can run on our smartphone. To be frank no…. we can run 2 whatsapp applications, today let us see how can we do that…. 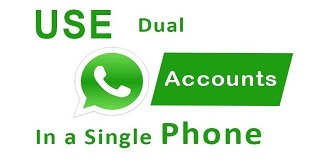 To run two whatsapp applications on same mobile first we need to have two or one network connections(sim). First of all install the whatsapp app from google play store. Step 1 : Go to your whatsapp application on right top there will be three vertical dots. Click on that there you can see ” Settings ” click on that. Step 2 : Click on ” Chats and Calls ” option. There by you can see the option called ” chat backup ” now click on ” Backup ” option. Now all your chats has been backed up. Step 3 : Now close your whatsapp. Go to the ” Settings ” of your mobile. Then go to ” Installed Apps ” ( Name may be changed from one mobile to another mobile) click on ” Whatsapp ” option. There click on ” clear data ” as soon as you click on that button you can see a conformation click on ” OK “. Now all data has been cleared. Step 4 : Now go to ” File Explorer ” in your mobile. Long press on ” whatsapp ” folder after the selection of whatsapp folder click on ” More ” option, click on ” Rename ” option. Step 5 : Now rename the folder from ” Whatsapp ” to ” OGWhatsapp “. Step 6 : Again go to Mobile settings – > Installed Apps -> Whatsapp. Now uninstall the whatsapp by clicking on ” uninstall ” option. 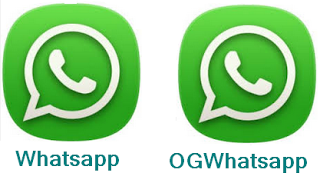 Step 7 : Download “ OGWA.apk ” and install OGwhatsapp into your mobile. If your mobile not supporting this install then go to developer option -> unknown sources. Step 8 : Once the OGWhatsapp installed click on ” launch ” -> ” Agree ” -> Enter your mobile number that you are previously used. Click on ” OK ” – > ” Restore ” -> Give Your Name -> ” Continue or Next ” That will be the first whatsapp. Minimize the whatsapp. Now on your mobile screen you can see two whatsapp. One is named with ” OGWhatsapp ” and other is ” Whatsapp “. Even though there are two whatsapp icons only one will be running. For the second whatsapp go to play store and install a whatsapp messenger with your second mobile number. Now the work is done you can use two whatsapp in same mobile.